Some, however, even manage to look beyond the momentary fireworks to examine the bigger picture. 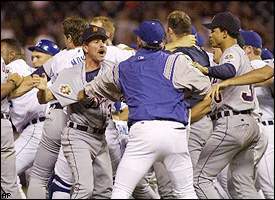 Such was the case with ESPN’s Patrick Hruby, who last week discussed the unwritten rules for baseball fights. For a 500-word summary, he pretty much nailed it. Yeah,you got it,J. Here in Pittsburgh the sports radio media has mentioned quite a few times,over the summer & recently, about various parts of The Codes & it is very obvious that they’re both misinformed & at least to some degree,ignorant of them-either singularly or collectively. Thanks, A.E. Taking sports-talk radio seriously can be a crapshoot. Locally for you, however, I’ll give Bob Cohn of the Tribune-Review some credit for covering various aspects of the Code this year. He’s worth a read.